Your ball end needs firm contact for the best results. Properly fitting your acoustic guitar strings is important. Inside your acoustic guitar, underneath the bridge, is the ‘bridge plate’. This is a piece of hard wood — maybe rosewood or similar but most likely maple — that’s there to strengthen the area and to prevent the string ball-ends digging into the relatively soft wood of the guitar top. When you’re stringing the guitar, you want to make sure that the string ball-ends contact firmly against this bridge plate. Good ‘coupling’ is typically a big factor in good tone. That aside, though, tuning up to pitch when the string’s not properly anchored can cause the string to ‘saw’ into the bridge and bridge plate. Over time, that can lead to nasty wear. Also, it’s not unusual for the ball-end to get hung-up on the end of the bridge pins (like in the photo above) This can lead to tuning issues or can even shoot your bridge pin out across the room. Yikes. As I mentioned, you’re aiming to have the ball-end anchored nicely against the bridge plate and secured with the bridge pin. Better. You want the ball-end snug against the bridge plate. As you’re stringing, insert the ball end into the hole in the bridge and then follow it with the bridge pin. Just as the pin begins to ‘wedge’, pull gently up on the string and you should feel it snug up against the plate inside. Do this slowly at first and you’ll soon get a feel for it. If this isn’t enough, you can always reach through the sound hole and manipulate things into position as you insert the bridge pin. 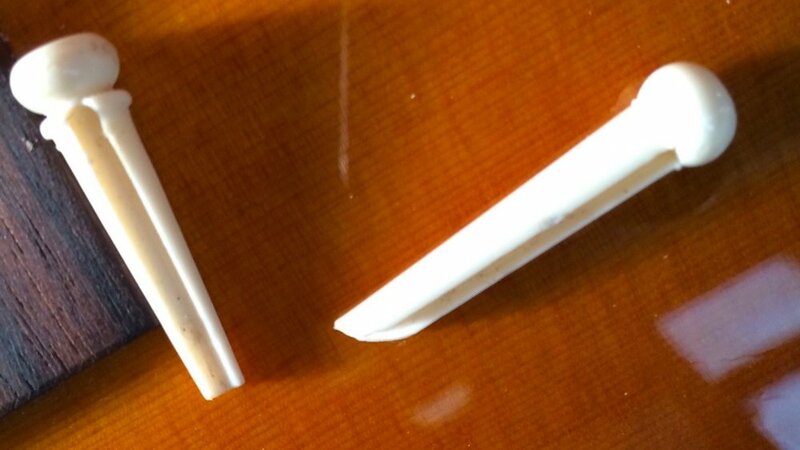 'Ramping' the end of a bridge pin can help the string ball-end slide off and avoid hang-ups. Using a little sandpaper, you can shape the end of your bridge pins. Taking that square end off encourages the ball end to slip off and makes it less likely that you’ll get them hung up. Pre-bending the string end can help guide the ball into the best position. You can use a needle-nosed pliers to hold the ball-end while you add a little ‘bend’ to it. Face this bend towards the neck as you insert the string and it gives you a head-start in keeping that ball-end nicely snug against the plate. And everyone should have snug ball-ends.